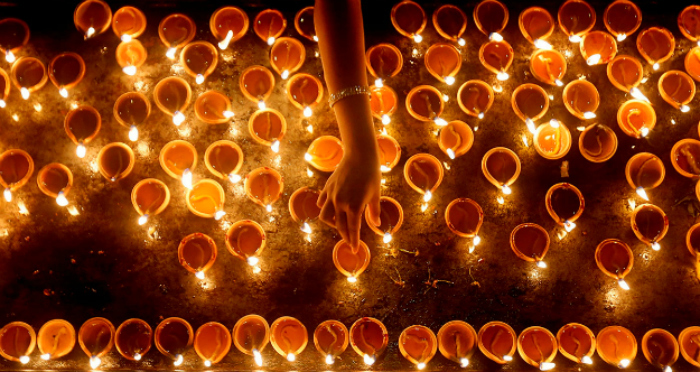 This week marked the multi-day Hindu celebration of Diwali, the Festival of Light. All over the world Hindus, Sikhs, Jains, and Newar Buddhists lit oil lamps and placed them in their homes and businesses to invite the Goddess of Prosperity, Lakshmi, to bring good fortune to them. She doesn’t come willingly, though; she needs to be enticed. Devotees clean their homes and light lamps, hoping the bright lights will attract her. Families gather to feast and give gifts. They gamble, believing that winners will be lucky in the year to come. They offer sweets and prayers to Lakshmi. As followers of Jesus, we also long for such things. What a precious truth it is that, unlike Lakshmi, Jesus did not need to be enticed to come near to us. He came willingly. We don’t merely hope that next year will bring good fortune. Followers of Jesus can leave tomorrow’s cares at His feet, knowing His plans for us are better than we could ever think or imagine. Our Hindu neighbors, surrounded by dozens of burning lamps, are still sitting in darkness. Jesus, the true Light of the World, came to “give light to those who sit in darkness and the shadow of death, and to guide us to the path of peace” (Luke 1:79). How can we share this Good News with our Hindu neighbors? Presenting the creation story is a great place to start. This establishes God as the creator of a perfect world. As Creator, the True God is so big that no idol can contain Him. When sin entered the beautiful, perfect world through Adam, it proliferated until God had to wipe out all he had made with a massive flood. He had to do this because his holiness could not tolerate the sin of the world. That Creator God is wholly holy is an important distinction because Hindu gods have both a good and evil nature. So, God started over again with Noah. But still sin and shame flourished. Eventually, God himself came in human form of Jesus Christ to deal with sin once and for all. By starting with creation we can explain why Jesus is the Only True Light of the world. Another way to reach out to Hindus is to follow Jesus’ strategy for outreach found in Luke 10. We pray for Him to do a miracle. A Hindu background believer shared the story of how her family came to believe in Jesus. At 16 years of age her sister, Judy, was diagnosed with lupus. At the time, not much was known about the disease so her family sought healing through Hindu rituals, visits to temples, witch doctors and shamans. When a Christ-following classmate asked if she could pray for Judy’s healing in Jesus’ name, the family, willing to try anything, agreed. The classmate and her brothers shared Bible stories of how Jesus healed the sick, and then they prayed, not just for Judy but for the whole family. In a few days, Judy started to feel better. The family rejoiced. A miracle! Soon after, her whole family, including extended family members, became followers of Christ. Similarly, there are thousands of former Hindus in India today who have given their full allegiance to Christ, because God provided a miracle when one of His children prayed. A worker on the field tells us that often when they pray for a miracle they wonder if God will actually do the thing they are asking Him to do. They doubt. But they pray anyway. And God displays His power, proving He is the ONLY WAY! . Please pray for more opportunities to share the true Light of the World with Hindus.